Can 21st century data science and visualization revolutionize the impact of art created millennia ago? Experts in the VIDA (Visualization Imaging and Data Analytics) research center at the NYU Tandon School of Engineering and art historians at the Frick Art Reference Library, one of the most prestigious art institutions in New York City, answered in the affirmative—and decided to offer the fruits of their digital collaboration free of charge to art historians, curators, and researchers worldwide. With the shift to digital media, physical lightboxes—used to compare, organize, and identify works of art—have become obsolete. To perform all of the manipulations that they are accustomed to doing manually, experts must cobble together a solution from Pinterest and applications such as Adobe Photoshop, Adobe Bridge, Adobe Lightroom, and Microsoft PowerPoint. However, such DIY solutions are limited in the features they provide and are cumbersome, requiring art historians to shuffle content between the applications. The NYU Tandon and Frick Art Reference Library teams responded by building ARIES, an intuitive web-based software platform now free for all to try at ARtImageExplorationSpace.com. The new tool simplifies the exploration, analysis, and organization of digital collections by allowing experts to easily manipulate images. While it is designed for art historians, curators and conservators, it can be used by editors, photographers, and even, potentially, physicians—anyone whose work involves manipulating and comparing images. ARIES was developed by a multidisciplinary team including Claudio Silva and Juliana Freire, professors in the Department of Computer Science and Engineering at NYU Tandon and faculty members of the VIDA Center; Lhaylla Crissaff and Marcos Lage, visiting research scholars at NYU Tandon; Joao Rulff, research associate at VIDA; R. Luke DuBois, artist, professor, and co-director of NYU Tandon's Integrated Digital Media program; and Louisa Wood Ruby and Samantha Deutch, the Frick Art Reference Library's head of research and assistant director of its Center for the History of Collecting, respectively. Their expertise combined to provide a completely integrated, highly versatile environment that gives users the ability to manipulate images as adroitly as if they were doing so by hand, as well as a powerful set of tools that allows them to perform functions they could not do with a physical lightbox or any other image management platform. Tools include zoom features, filters, annotations, lenses, selection, tagging and meta-textual tools, and means of sharing collections with others. 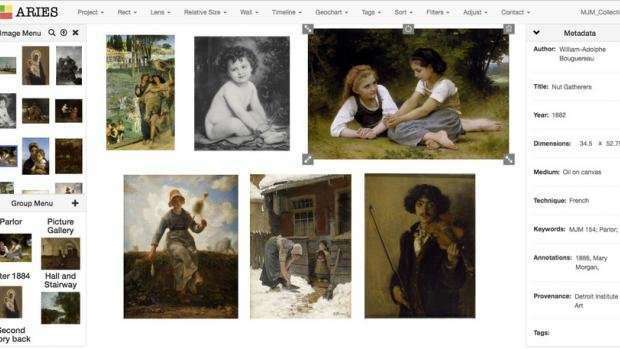 "As the world is digitizing and moving from physical to virtual, art historians and collection curators seek a digital replacement that is as close to their current workflow as possible," said Silva. "But the tools they use were designed for other purposes. ARIES is the first tool designed specifically for them, with the workflow they are used to and the kinds of intuitive analytical tools they need. "And because ARIES is also web-based, it is portable and free of the complexities of installing a system," he added. "This is especially important for our target users, who have little or no expertise in computing." Crissaff, who led the development of the system with Silva, explained that the VIDA team built the first iteration of ARIES in 2015 and has been improving it ever since. "From the outset, we developed it as a free tool, so it's important for us to see it adopted widely and impact the larger art history community," she said. At the Frick Art Reference Library, Deutch and Ruby are using the tool in their daily work. Ruby has been able to closely compare images of drawings and paintings that will appear together in an exhibition in Antwerp in 2019. Deutch is using ARIES to analyze the historical art collection of Mary Jane Morgan (1823-1885). The two art historians said that "ARIES has given us the ability to work more efficiently with digital images—everything we need is available on a common platform." Deutch added that she even uses the platform at home to organize images from her shark-diving trips around the world. Silva said the team is releasing new features incrementally and plans to harden the software; improve documentation, tutorials and case studies; and broaden the user base. ARIES was funded by an anonymous contribution. Crissaff was supported by a postdoctoral fellowship from CNPq-Brazil. The research is supported by a computational research infrastructure (CRI) grant from the National Science Foundation.